It's hard to hire developers, and technical resources are expensive. Everyone is trying to figure out how to attract top talent, reduce turnover, and increase productivity of existing staff without reducing their work/life balance. Early on, I decided that if you're going to spend 8 hours a day 5 days a week for almost 50 weeks a year doing something, everything about it should be as pleasant as it could be. I bought a new Macbook pro and two thunderbolt displays. Those investments very quickly paid off. Until recently, the benefits of large technology investments were just intuition. Last week, I realized how much more productive I was working remotely than when I'm onsite with the client. One reason is that when I'm remote I get a lot more flow, but another reason is that when I'm remote, I have a lot more screen real estate so I can see a lot more information at once. I decided it was time to be more productive onsite too. This time, I wanted to have more concrete justification. A friend of mine and I did a fair amount of research picking out monitors that gave us the best bang for our bucks. I'm really happy with my Thunderbolt Displays. They're IPS and they're quite high PPI. This time, I wanted to try something a little cheaper and a little larger and I wanted to try a VA panel so I ended up getting a BenQ BL3200PT. This monitor, I think, has the same panel as the Samsung S32D850T, which has a slightly smaller price tag. When I talk about screen real estate, I'm not talking about the diagonal size of the screen; I'm talking about the resolution of the screen. Having a larger screen doesn't do anything for you (at least not in the sense of a computer monitor) with regard to how much information you can fit on the screen at one time. 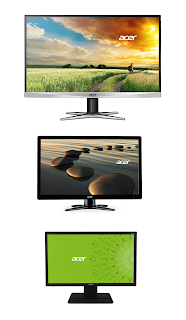 The difference between an HD 1080 screen at 27" vs. 32" is just stretching. Resolution, however, is how many pixels the screen has. The more pixels there are, the more options the computer has to present data (provided you have the visual acuity to perceive the data without scaling). These displays are 2560 x 1440 or WQHD and are the same resolution as my thunderbolt displays, albeit over a larger surface area. Thus the resolution is not quite as crisp as my thunderbolts, but still these are very high quality screens. If you're into lower pixel pitch and higher PPI, I don't blame you. Higher pixel density screens are much more pleasant to look at, but they do come at a cost. There are two very common resolutions in offices these days. An older WSXVGA+ which is an 8:5 aspect display at 1680 x 1050 pixels. HD 1080 is also quiet popular which is the 16:9 display at 1920 x 1080. The HD 1080 has about 17.6% more pixels than the WSXVGA+. By comparison, the WQHD, also 16:9, has 2560 x 1440 pixels (sometimes called 1440P). It has about 77.8% more pixels than HD 1080 and about 110% more pixels than WSXGA+. That is to say that if you have 1 WQHD display, you have more pixels than a dual screen WSXGA+ setup. The benefits of additional screen real estate, unfortunately, are easier to experience than they are to describe. Having additional real estate may mean that you will sense more data at the same time, but does not necessarily mean you will perceive these data. Similarly, having the ability see multiple windows does not mean that you won't just continue editing one file at a time in a full screen editor. On the other hand, not having the ability to optimize your workflow guarantees that you will not. I do have a few anecdotes that buttress my belief that having more screen real estate is inherently valuable. One time when I'm particularly keen to the benefits of higher resolutions is when I'm developing responsive designs. I'll often dock my browser's DOM inspector on the side and I'll slide the split pane to different responsive breakpoints watching the HTML/CSS changes flash in the inspector. The additional real estate means I can see meaningful data in the DOM inspector and the responsive design at the desktop breakpoint at the same time. Another time I notice the benefits of having additional screen real estate is when working on native mobile applications. Native development often involves simulators and emulators. Scaling during emulation isn't always well supported. Thus, the additional pixels allows you to see the entire simulator at once. Another example that I found particularly fascinating happened shortly after I took over a new project. I had been working on the project for a few weeks from the client site. One day, I was working remotely and I had my terminal window off to the left and I had the application in a browser to the right. This is a usual screen configuration for my workflow on my cinema displays. I had changed some code and the application reloaded. When it did, I noticed dozens of queries pop up in the log. None of the ORM queries had been optimized to prevent N + 1 queries. I spent a few hours fixing those, but may never have noticed them had I not had enough room on my screen to comfortably view the browser and the terminal at the same time. Typically on HD 1080 and especially on WSXGA+, I have only one window visible at a time. That's why I didn't notice the N + 1 queries until I was remote. There may be myriad other benefits of the additional screen real estate when considering looking at code in multiple panes, test driven development, debugging, guard and live reload, etc. High quality screens can be expensive! The thunderbolt displays are almost $1,000 each. The BenQ was $550. The Samsung is $500. It's hard to imagine pulling out all of your existing displays and replacing them with displays that cost several hundred dollars. Heck, I spent hours justifying buying only one. That's why it clicked. At some point I realized, it doesn't take much before the investment in display technology pays off. According to several job posting / salary research sites, the average developer in Atlanta makes about $120K per year. To keep the math easy, I'll call it $100K (also because I like lowballing estimates like this). Normally, overhead on a W-2 employee is roughly 25% - 50% of annual salary. If you have a very modest benefits package (and not a lot of PTO), then an average developer in Atlanta will cost about $125K per year. Even if your organization buys these screens the same way I did (i.e., no sales tax and no bulk discount), then it'll cost about $550, or about 0.4% of the cost of an average developer. That means that if you bought 100 of them, it would cost less than half of the annual salary of your average developer for a year. Thus, if you have 100 developers and you get 100 screens and each developer is 0.5% more productive for the year, then you actually make money on the investment. If the cost still seems too high, you don't have to get VA panels. In fact, 32 inch screens are pretty big (they take up a lot of desk real estate too). These 25" Dell U2515H IPS panels were only $350 at the time of writing. 100 of these would be less than 1/3 of the underestimated developer annual cost. The average American works 1,780 hours per year. To recuperate 0.28% of a developer's cost, the developer only needs to produce about 5 hours more per year. That could be working an additional 5 hours per year because work is more fun. It could be 5 hours saved by not having to tab between windows and the cost of brief context switches. It could be 5 hours not spent tracking down performance issues in production because some N + 1 queries sneaked through. It could be 5 fewer hours spent recruiting great job candidates because the technology makes the company a better place to work. Developers with neat technology are more inclined to passively as well as actively recruit for you. This can bolster your recruiting efforts, also saving money. Similarly, developers with a satisfying work environment are less likely to leave their jobs reducing the high cost of turnover. Studies on worker productivity show that American workers tend to have about 6 (and some studies show as few as 3) productive hours in an 8 hour workday. Better screens may improve ideal hours per day. That means if all of your developers show up Monday morning and find their brand new screens, and in their excitement they're productive for 8 hours on Monday and Tuesday (rather than 6) and 7 hours on Wednesday, then in the first 3 days, the screens have paid for themselves. I could be completely wrong about everything else and your net could still be more valuable somewhat liquid (they have good resale values) assets for free. Remember, you only need 5 additional productive hours per year to cover the cost of 1 high resolution display … and that's if you buy new screens every year. If you plan on keeping the displays for 5 years, it's just 1 hour per year. Let's consider a more pessimistic case. Let's say your staff, on average is pretty junior (and you're using technologies that aren't particularly backend heavy. If that's the case, your developers may cost you an average of $80K salary and per year and $20K in benefits, taxes, recruiting efforts, etc. Let's say they also take no vacation or sick leave and thus work a full 2,080 hours per year. Further, your staff is productive 100% of working hours. In this case, you're paying an average of $48 per productive work hour. If you buy very nice displays at say, $960 each, then you need 20 additional productive hours to cover the cost of one display. Even in this very unlikely case, that's less than 1% per developer. And they don't need to work 2,100 hours in a year per se. They can be 1% more efficient. That means if they're writing 100 lines of perfect code per day, then to cover the cost of a new display, they only need to write 100 lines of perfect code per day (and on the tenth day, perhaps they write 10 extra perfect line of code . . . or better yet, they delete a line or two). More likely your average developer is closer to $125K per year, they work 1,780 hours per year, and they are productive fewer than 6 of every 8 hours. Thus, their cost is $94 per productive hour. Also, it's very reasonable to get smaller IPS WQHD panels for $350 each (especially if you have a large team and get a bulk or corporate discount). So, you need fewer than 4 hours per developer or 0.3% more productivity. An average developer contributes 10 lines per day to the codebase (Mythical Man Month) so to break even on your investment, your average developer only needs to net an additional 3 lines of code every quarter. n.b., I don't support using lines of code as a measure of productivity. It's merely illustrative of the relative scale of the cost of a display to the cost of a developer. Try your own calculations using bugs sent to production, mean time to defect resolution, etc. I recommend making an investment to replace low resolution displays for developers and pairing stations (and I would consider broadening the reach really to non-technical employees as well) with high resolution displays. I think that the cost of the hardware would be recovered very quickly by improved developer efficiency and performance. The investment is low risk because the cost is relatively low and the displays are a moderately liquid asset. If you have 100 developers on your team, it may be hard to get approval for the capital to buy $35,000 worth of displays. In that case, you can always hire another developer (well, you can try at least) for $35,000 per quarter.